The Arabian coffee tree is the world’s primary source of coffee beans. This tree is native to Ethiopia but the popularity of coffee, and demand for beans, has resulted in growing operations throughout the world. 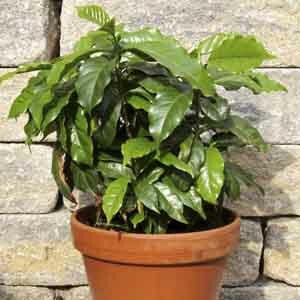 Coffee trees produce big, glossy, beautiful foliage and make excellent houseplants for bright locations. Plants are not likely to bloom and produce beans when grown as a houseplant. They can also be grown in the ground or large patio planters outdoors in temperate climates. A great potted plant for a sunny spot indoors or on a lightly shaded deck, patio, or porch during warm weather. A lovely landscape plant for warm, frost-free climates. Thrives in a warm location with bright, indirect light. Keep soil consistently moist. Can be pruned freely to maintain desired size.